I was always obsessed with food, but recently I got also obsessed with cooking. I only hope that when I qualify from a cooking rookie into a chef I'll still be wearing the same size ;-P.
A healthy tropical drink plus the wrap up of my Weightlossophy. Ok, so this is the last day of my one week detox. The idea was to eat unprocessed foods avoiding gluten, lactose, alcohol, caffeine and meat. I do not feel any effect of this detox, but I lost 4 pounds. 2 will be back as soon as I have a “normal” meal, but even 2 pounds per week is pretty good, right? Also, this week I was posting my Weightlossophy tips, which I followed when I lost 55 pounds over 7 months last year. So here are the last general thoughts and the recap with links to all the previous tips. I have been complaining about weight almost all my life, even when I was pretty skinny as a kid. I had many sporadic diets, after which I almost always gained even more weight. A standard story, really. This time the primary difference was a very strong motivation and a deadline that came with that motivation. I really really wanted to lose weight and was ready to start the diet “right now.” The problem with many short term diets is that you tell yourself: I am starting a diet tomorrow, today is the last day of “normal” eating, so... let’s binge! And then when you’re dieting one day something goes wrong, someone brings a cake to the office and you eat 2 pieces, you feel that “today is ruined anyway, so let’s binge today and tomorrow back to the diet.” And so it goes on. The problem is that in one binge you can eat 3,000-5,000 or more calories. It will take a week to compensate for it. And by the end of the week you’ll be so demotivated that you’ll binge again. Now I realize why such diets did not work for me. Because I “wished” I had lost weight, but not “wanted it badly enough” to commit. Don’t begin a serious long-term diet unless you are absolutely motivated, determined and committed. If you plan to start it “tomorrow” or “next Monday,” it would most likely only result in unnecessary suffering and additional weight. It makes sense, does not it? Why fight so hard for something which is only in the “wistful thinking” category? Just accept that for now you can live with your weight as it is and spend your energy on more crucial things. Don’t bother with diets unless it’s a top priority for you. I suppose that would be my primary dieting tip :-). If you are motivated, than good luck! And I hope you find some of the tips that I published this week useful. I don’t claim that they would all necessarily work for you - everyone is different and needs a different diet that he can sustain. But even if one of these ideas might appeal to you or inspire you to make some improvements in your diet, I will be very happy. We’re all together in this “diet” thing :-). Reserve 1,2 lemon slices for decoration. Crush the remaining ingredients in a blender. Enjoy! Wonderful vibrant photo. So alive. Best of luck with everything you are trying to accomplish. You are providing very useful information here. Nice drink... I think if I can get sweet mango, I may not even need the agave nectar. BTW, for a brief explanation on the water roux function, please check my reply to your comment. Reading through that post. Every part of it just resonates with me. I'm currently on a diet where I've gradually cut out carbs, however I have days where I have cravings for something sweet. Unfortunately once i start with a piece of chocolate I must have the whole block. And so the cycle begins. I think you're right in saying that weight loss is achievable if you really wanted it, as opposed to wishing for it to happen. 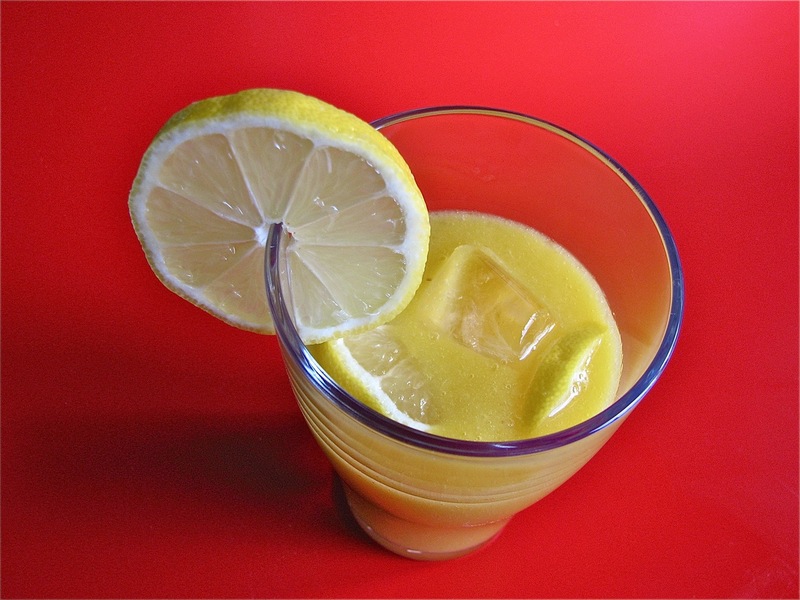 I love this recipe, very refreshing with the mango. For me also it's best when I can just cut out the food I crave. Sometimes the craving passes, especially if I find something else that fulfills the same function: let's say if I can eat dried fruit instead of chocolate. But if the craving continues, avoiding it sometimes only results in a complete collapse. So in those cases I try to make a controlled decision: tonight I will eat chocolate (simply knowing that I will be able to eat it later often makes me happy with anticipation). I will eat only 1 square and it will be only 30 calories, so it's not a big deal. I will get the best chocolate I can. I will eat that chocolate when I am completely not hungry. I will take that 1 square far away from the kitchen (and the rest of the chocolate), put it on a nice plate, maybe bring a cup of tea, maybe even light a candle to make it feel like a special occasion. And then I will eat it very very very slowly. And if I want more after that, I can decide to have more tomorrow. Maybe by tomorrow I'll change my mind :-). A lovely, healthy drink for any time. I like it. WOW! This is definitely a healthy and refreshing drink. A gorgeous drink and words to remember! Anyone who has ever struggled with weight issues will be vigorously nodding in agreement as they read your post! what a refreshing drink...love all your posts.. Wonderful, healthy drink - and such a great idea to add a slice of ginger!.. This is a Flickr badge showing items in a set called Food Stuff. Make your own badge here.